We only have a week left before school starts. So we are doing our best to live large for the next few days. The plan.. to spend as much time with the kids as possible because on Monday everything changes. 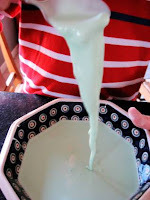 On the agenda, (the kids have decided the agenda), Oobleck. What is oobleck you ask? Pretty much the coolest "goo" you can make. Now I am not a fan of "goo." I don't really even like play dough. In fact there isn't any in our home. Gasp!!! So making Oobleck in our house is a big deal. Oobleck comes from a Dr. Seuss Book. A favorite ever since my son read it in school. Then make your very own "goo." Decide if you are going to color your oobleck. We are. There will be pink for the girls and orange for our son. Mix a few drops of food coloring with your water. Then mix the colored water and cornstarch in a bowl. Put some muscle into it. Don't give in to the urge to add more water. You'll know when it's ready because you will be able to hit it AND pour it. Amazing. Our son thinks this is the coolest science project ever. He wonders if this is how magicians walk on water. You and your kids will play with this for hours. Cherish these last few days of summer. Spend some time together. DO YOU HAVE PLAY DOUGH IN YOUR HOUSE? 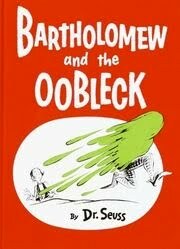 HAVE YOU READ BARTHOLOMEW AND THE OOBLECK BY DR. SEUSS? Cool. We don't have playdough anymore. Too many messes and not cleaning up led to it leaving our house for good. Does this make a lot? Or do you make one batch for each child? No, doesn't make too much at all. We will make a batch per child so they have enough to play with. Glad to hear I am not the only mom who doesn't do play dough. I don't like the mess or the smell, or digging it out from under my kids nails. If we do play dough, we go out in the front yard, lay on the grass and use different kitchen utensils to make fun shapes. then any little pieces fall into the grass and not the carpet. We do play dough, but it's a huge mistake, because we have carpet under our table (also a huge mistake). Quick question, do you mix with a spoon, or your hands, or something else? 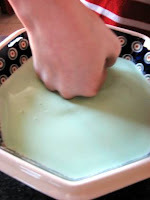 I use a metal spoon to do all of the mixing, then we start playing with our hands. We tried it! I'm not sure I ever got the consistency right, but man was it MESSY. Yeah, I am glad you tried it. Did the kids love it, or was the mess to much? It should have poured off the spoon, but you should have also been able to punch it with your fist. Give me more details, maybe we can trouble shoot.